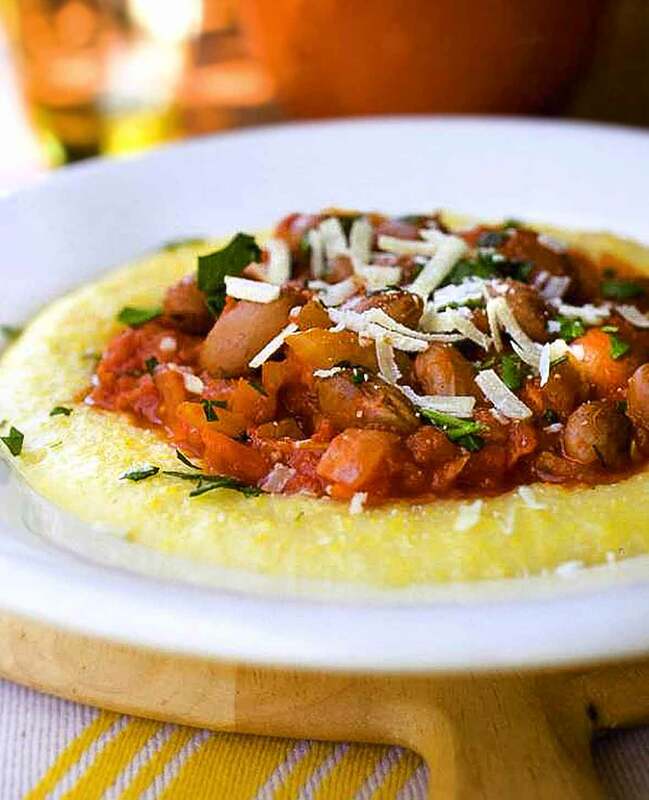 As the headnote says, this borlotti beans with creamy polenta is a complete winter’s meal. But don’t let that stop you from making it a complete autumn’s meal. Or early spring’s meal. Or any other time of year when it just happens to be a tad chilly come evening. Like tonight, perhaps? 1. In a small Dutch oven or other heavy pot over medium heat, melt the butter. Add the onion, the fennel, the garlic, 2 teaspoons oregano, the red pepper flakes, and a pinch salt. Saute until the vegetables are soft and fragrant, about 10 minutes. 2. Add the carrot and saute for 2 to 3 minutes. Add the tomatoes with their juice, stirring to break them up with a wooden spoon. Add another pinch of salt. Reduce the heat to low and cook, uncovered, at the barest simmer, stirring occasionally, until the tomatoes are reduced and beginning to separate from the oil, at least 2 hours or up to 3 hours. 4. About 45 minutes before serving, bring the water to a boil in a medium, heavy-bottomed saucepan. Add the salt and, whisking continuously, slowly pour the polenta into the water in a thin stream. Reduce the heat to low and cook, stirring nearly constantly with a long-handled spoon, until the mixture thickens, the grains soften, and the polenta begins to pull away from the sides of the pan, 40 to 45 minutes. Stir in the butter and 1/2 cup Parmesan and season with pepper. Cover to keep warm. 5. Add the beans to the tomato sauce and warm them together over medium-low heat, stirring occasionally. Stir in the parsley about 5 minutes before serving. 6. Spoon the polenta into warmed shallow bowls and make a well in the center of each serving. Spoon some of the beans and tomato sauce into each well. 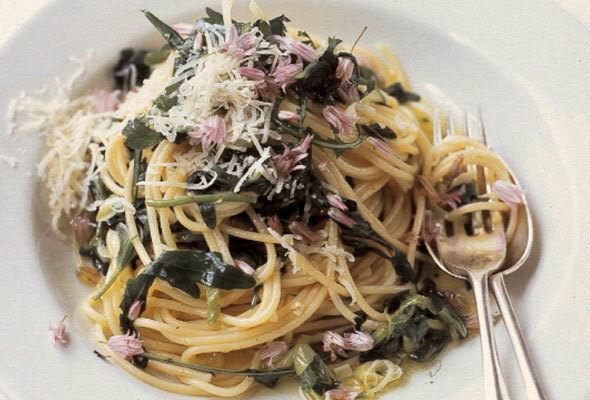 Garnish with Parmesan cheese. Borlotti Beans with Creamy Polenta Recipe © 2008 Steve Sando and Vanessa Barrington. Photo © 2008 Sara Remington. All rights reserved. All recipes and photos used with permission of the publisher. This vegetarian dish has it all. In fact, we didn't even miss the meat. The borlotti beans are creamy, the chunky tomato sauce flavorful, and the polenta creamy and cheesy. Fennel makes an appearance, lending a subtle, sweet anise flavor. The parsley perked it up aesthetically. I really liked the grated carrot in the tomato sauce; it added an earthy sweetness. It's the quintessential picture of autumn. The only thing I would change is to use cream instead of water in the polenta (yes, I love it extra creamy). This is the dish to curl up with under a cozy blanket with a fire roaring in the fireplace. It is hearty, homey, and comfortable somehow. Nothing fancy, just really good rustic food. As a bonus, this tomato sauce would be wonderful on pasta or stirred into a bowl of chili or soup. This was wholly successful as a vegetarian winter entrée. It was visually appealing, nutritionally balanced, and tasted great. There were flavors and flavor combinations here to stimulate jaded winter palates as the combination of beans, fennel, and polenta was interesting not only in terms of taste, but also texture. The fennel is a gentle yet pleasantly surprising presence. And in the creaminess arena, this dish is the satisfying and happy melding of cheesy, creamy polenta and rich, creamy beans. While the dish would have stood well alone, I accompanied it with a peppery sautéed green chard to add to the color palate and visual appeal of the meal. A moderately carnivorous friend read the recipe’s introductory note after eating this dinner, and agreed that the Italian sausage would be an excellent topping, as suggested. Nonetheless, he dubbed the vegetarian version a keeper, noting “I could eat this every day!” The search for the borlotti bean was worth it; researching this bean, I learned it is also known as the cranberry bean, which is what I used after finding it at a well-stocked Italian grocer. This is so delicious. Great meal for a cold evening. I doubled the recipe for a dinner party for 20 people. I hosted a polenta party and made several options to top the polenta – borlotti beans, braised short ribs, pan roasted chanterelles. Surprisingly, these beans received as many oohs and aahs as the rest of the accompaniments. Also great the next morning with eggs! Yet another winner. Magnificent to hear, Lynn! Thank you SO much for taking the time to let us know! It’s rare when folks rave about beans so we’re incredibly pleased to hear it passed muster! And yes, eggs on top of just about anything makes a pretty damn fine breakfast, yes? !